David Lee is the editor of ImprovNotes. He worked extensively with IICSI while completing his PhD in Literary Studies and Theatre Studies in English at Guelph. He looks forward to applying some of the ideas he’s discovered in Critical Studies in Improvisation to further teaching, both in literature and in music. 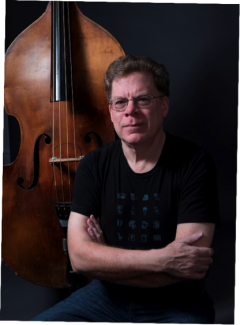 As a double bassist, David has been active for over three decades in jazz and improvised music, as well as working with poets, actors, and dancers. His books include Stopping Time: Paul Bley and the Transformation of Jazz and The Battle of the Five Spot: Ornette Coleman and the New York Jazz Field, as well as the award-winning Chainsaws: A History, the literary novel Commander Zero and his recent Lovecraftian YA novel, The Midnight Games. David was awarded OGS and SSHRC funding in the course of his PhD studies, and completed his dissertation on the history of improvised music in Toronto. He holds an MA in Music Criticism from McMaster University, and a BA in English from the University of British Columbia.